Breast pain is defined by the general feeling of discomfort, tenderness, or pain in one or both breasts. The primary cause of breast pain is hormone fluctuations, specifically of estrogen and progesterone. These hormonal fluxes cause inflammation of breast tissue, resulting in pain. What you eat can also lead to breast pain, so it is important to maintain a healthy and balanced diet. 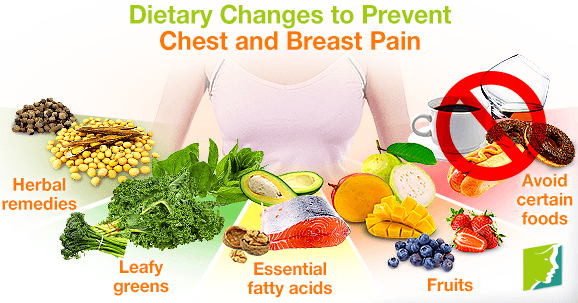 Keep reading to learn more about the dietary changes you can make to prevent chest and breast pain. Chest pain is characterized as a tight feeling of pressure in the chest, and it is a common symptom of anxiety attacks. People often mistake chest pains for heart attacks, but it is important to know that it should subside after a while. Chest pains can be accompanied by shortness of breath and breast pain. Breast pain can range from mild to severe discomfort, and can include sensations like sensitivity, burning, swelling, sharp stabbing sensation, and tenderness. Cyclical breast pain is the most common type of breast pain, and is recurrent during menopause, menstruation, and pregnancy. Eating healthy can considerably help ease chest and breast pain, as well as provide sufficient energy throughout the day. As a general rule of thumb, you should always include protein, fruits and vegetables, dairy, and grains into your daily diet. Here are some beneficial healthy dietary changes. There are some foods that you should steer clear of to prevent chest and breast pain. These pain triggers include fried food, spicy food, processed meats, candy, caffeine, and alcohol. Foods that are rich in essential fatty acids are beneficial to your overall health. Avocadoes, salmon, and walnuts are all packed with essential fatty acids. Avocados are also rich in B vitamins, which help relieve stress and promote healthy nerves and brain cells. They are also a good source of unsaturated fat and potassium. Spinach, kale, broccoli, and collard greens are all packed with nutrients. They are often overlooked or not consumed enough, but there are plenty of recipes out there that can transform them into tasty dishes. Guavas, mangoes, blueberries, and strawberries are all delicious fruits that can help reduce chest and breast pain. These fruits are great on their own, or added to smoothies, yogurt, or salads. Herbal remedies are a low-risk and cost-effective alternative to treating breast pain. Two popular herbs for treating chest and breast pain are chasteberry and soy. Chasteberry reduces production of prolactin, a hormone that causes breast pain and swelling in excess. Soy has been a popular herb among menopausal women because of its phytoestrogenic compounds. These herbal remedies can be taken as dietary supplements. Chest and breast pain affects around two-thirds of women and can range from mild to severe. The most common cause of breast pain is hormone fluctuations, but it can also be caused by poor diet. While maintaining a healthy and active lifestyle is important for your overall well-being, it is also essential to maintain a balanced diet. An ideal daily diet should consist of protein, fruits and vegetables, dairy, and whole grains. What Is the Relationship between Menopause and Breast Pain? Sharp Breast Pain: Should I Be Worried? Breasts Cysts: Should I Be Worried? Read all about right breast pain throughout the menopausal transition here, including causes, when to be concerned, and treatment options. Does Caffeine Cause Breast Pain? Read to find out if your consumption of caffeine may cause breast pain or not.